I bought this book for my son’s girlfriend as a birthday gift and we sat on Sunday and both coloured in a page from the book which was really nice. The book is amazing and so true to the whole Cath Kidston theme. 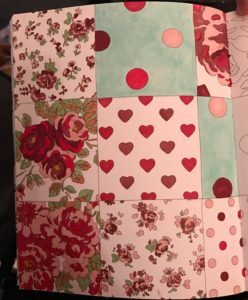 The familiar patterns are displayed in the front of the book in full colour so they serve as a guide when you are thinking of what colours to use on the pages. Some of the themes include Chelsea flowers, London buses, circle ditsy, shooting stars, lace stripes, chicken, planes, Aubrey rose, royal rose, London, fire engines, outer space, garden birds and many more. The paper is thicker than regular photocopy paper and my guess would be it is around 160gsm (possibly thicker). It is white with black printing on the pages. The pages are not framed. The pages are also not perforated so you would need to be careful removing the page you colour in from the book. I use alcohol ink pens and I put a piece of cardboard under the picture that I am colouring as it will bleed through to the other side. The pages all have printing on both sides so this book would be more suitable with colouring pencils instead of alcohol marker pens. Some of the designs stretch over both the left side and right side of the book and are the same pattern while others have the same theme but are slightly different on the left than on the right. I really like this book and have bought myself one too. For anyone who enjoys colouring and likes Cath Kidston style then this is a must. It makes a great gift and the book has a cover with a fold on the front and back that could be used to keep your place in the book – like a book marker. I bought this book because I like the unusual style of the author of this colouring book. It is quirky and unique and the cats are all different breeds. The pages are white and printed in black. The pages are not perforated so you would need to be cautious tearing the pages out of the book. There is not border frame around the pictures. Each picture is on the right hand side of the book so the left is blank, this is suitable for using alcohol ink pens as the picture does not have another one directly behind it, although alcohol ink pens will mean that the ink runs through and you would need to put a piece of cardboard behind the picture you are colouring in if you use alcohol ink pens. If you use colouring pencils this will not be necessary. There are over 40 different designs, all lovely and as nice as each other. 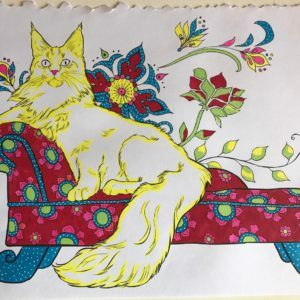 Some have more than one image of a cat and some show the cat with flowers, a mouse, fish, bird, butterfly and patterned designs on the cat/kitten. They are fun and all very different with no pages looking similar. I really like the style and the variety offered in this book and look forward to other books by the same author as I am sure they will be to my taste. If you like cats then the choice in this book would be pleasing to most people.